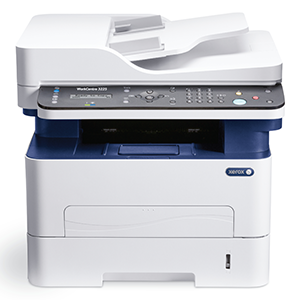 The Xerox 3225VDNI is an excellent monochrome all-in-one multi-functional printer. It has print, copy, scan, fax and email features that make it versatile enough for almost any office. Wireless functionality and automatic, double-sided printing make it very user friendly. Unfortunately, this printer can only print in black and it is not very fast, with a low duty cycle compared to other monochrome printers. The Xerox WorkCentre 3225VDNI weighs 11.4kg and measures 401 x 362 x 365mm. It features an easy-to-use LCD display and simple buttons on the black control panel area. The colour scheme is white around the sides, with a dark blue band wrapping around the upper middle section. The paper output area has an elevated paper catcher to allow professional print jobs with high-density ink to dry easily. The paper tray in the front is easy to load with plenty of paper. The Xerox WorkCentre 3225VDNI prints at a speed of up to 28 ppm in black. The duty cycle is up to 30,000 pages per month. Wireless connectivity and mobile printing add convenience. Automatic double-sided printing makes this printer cost-efficient and eco-friendly, since this feature saves money and paper. Maximum print resolution is above the rest, at up to 4800 x 600 with enhanced image quality. Copy resolution is up to 1200 x 1200 dpi. The first print can be produced in as few as 8.5 seconds. The multi-functionality is extremely helpful with scanning, with resolution up to 1200 x 1200 dpi or 4800 x 4800 dpi enhanced. Standard fax and security are also provided. Standard features include two paper trays and an automatic document feeder. While this Xerox 3225VDNI is multi-functional, it does not print in colour. Unfortunately, it is not very fast and the duty cycle is not the highest for a monochrome printer.